For some reason I get logged out when looking at your thread, so can’t answer your post from there, or see your pictures. I also built my own faceting machines, my current one is the fifth I’ve built over the years and is the machine I use to cut competition stones for both the US, UK and Australian Guilds. 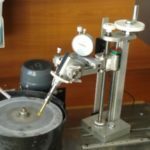 If your keen to continue making faceting machines there is a link on the forum to an extremely well-built machine by Robert Slater. Anyway, answering your question. Cutting the first row of facets adjacent to the girdle often needs to be adjusted with the cheater to get them all perfectly aligned. The same setting for all the facets. If the shaft through the quill base is perfectly square to the quill and the side supports are perfectly aligned. You should be able to cut a stone like the one in the picture through all the steps without anything more than very minor cheater changes to keep each row perfectly level and finish with an accurate point. I have never been able to build one that accurate and incorporate an adjustment for the side bearing, see picture. If cutting a stone like the one in the picture requires cheater adjustments from one row to the next, I adjust the bearing position till all the rows are perfectly level. Once the bearing is in the correct position it never needs moving again. Because I can’t see your pictures I’m assuming it’s the typical mast type that slides toward the lap as the angle of the quill gets steeper. If so keep the base pointing the same way at all times.